Last month, a tractor trailer rollover accident caused a busy Route 24 on-ramp in Stoughton to be closed for several hours. According to the Massachusetts State Police, the rush hour accident left scrap metal littered along the northbound ramp leading from Route 139. Interstate Wrecker Service of Canton was tasked with cleaning up the metal debris. Although no one was injured in the crash, the State Police Media Relations Office said the cause of the tractor trailer accident is still under investigation. Tom Broderick of the Massachusetts Department of Transportation said although semi accidents are not more common than automobile accidents, they tend to be more severe. 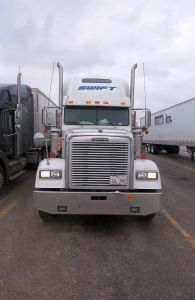 Additionally, tractor trailers often roll when traveling at a high rate of speed. Recently, the Massachusetts State Police Commercial Vehicle Enforcement Section reportedly began conducting targeted patrols of Route 24 due to reckless driving concerns. Over the course of two weekends, 19 semis were stopped by law enforcement officers for speeding. Additionally, State Police conducted 28 truck inspections, issued 49 citations, and pulled two tractor trailers out of service. Sean McNally, a spokesperson for the American Trucking Association (ATA), stated the organization supports efforts to ensure that all semis are equipped with electronic sensors that may prevent rollovers and collisions with other vehicles. The electronic sensors are designed to engage a tractor trailer's brakes when it is in danger of tipping or moves too close to a passenger vehicle. McNally said trucking fleets are increasingly installing the technology in an effort to increase safety. The ATA also reportedly supports decreased speed limits on all of the nation's roadways. Regrettably, car, truck, and motorcycle collisions are one of the leading causes of personal injury and death throughout the Commonwealth of Massachusetts. You are placed at risk of injury every time you travel on a Massachusetts roadway. Unfortunately, most collisions that involve a semi truck cause catastrophic injuries or death. The victims of a truck accident may recover compensation for medical expenses, disability, physical therapy, suffering, pain, lost wages, and other damages. An individual who was injured in a Massachusetts motor vehicle collision may also be eligible to receive Personal Injury Protection (PIP) benefits from an insurance company. If you were hurt in an accident caused by a truck or other motor vehicle deriver, a skilled Massachusetts personal injury lawyer can explain your right to recovery. If you were the victim in a Massachusetts tractor trailer or other accident, please call the Law Offices of Sousa & Sousa, P.C. at (508) 230-5300 in Brockton or (508) 823-6111 in Taunton. Our capable Brockton personal injury lawyers have more than 50 years of combined experience assisting Massachusetts clients achieve fair compensation following an unexpected injury accident. The Law Offices of Sousa & Sousa represents clients who were hurt through no fault of their own in Brockton, Easton, Bridgewater, Taunton, Stoughton, and other surrounding towns. To speak with an experienced personal injury attorney today, please do not hesitate to contact the Law Offices of Sousa & Sousa through the law firm's website.